Order your Caran d'Ache Leman Caviar 0.7mm Pencil today from FahrneysPens.com. Fine Pens, Refills & Luxurious Gifts – great prices & fast shipping. This year, Caran d'Ache celebrates 100 years of creativity, quality, innovation and exceptional Swiss-made writing instruments! For the occasion, the master craftsmen at Maison Caran d'Ache have created a dazzling array of new products which we are delighted to present to you. The elegant Léman collection has a luxurious new finish known as 'Caviar', a unique fusion of lacquer and guilloche engraving. 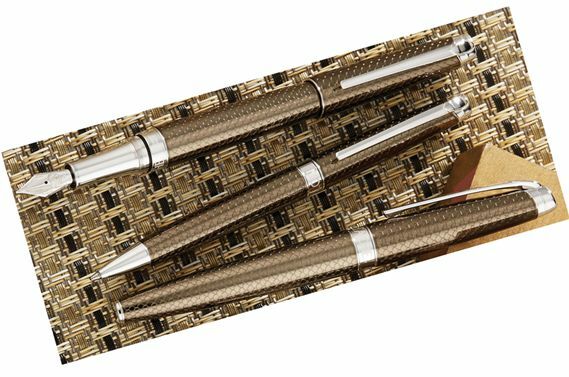 Glossy, amber-tinted bronze lacquer envelopes the pen body, revealing fine, undulating engravings underneath that create shimmering reflections like caviar beads. 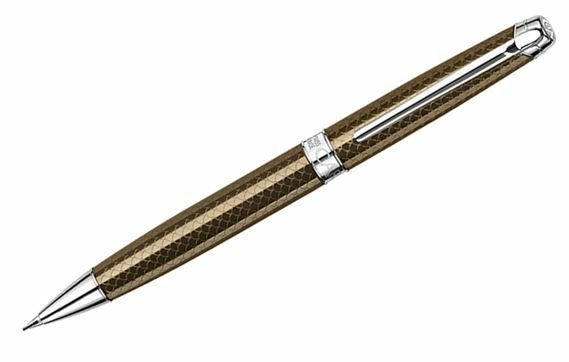 The Léman Caviar writing instruments are accented with precious rhodium and silver and are offered in four modes, including a 0.7mm pencil, capped rollerball, ball pen and the outstanding fountain pen with 18K gold nib. You'll savor the refined pleasure of writing with Caran d'Ache Léman Caviar.